Even the goalscoring return of talismanic striker Dan Simmonds couldn’t get Pagham through to the RUR Cup semi-finals as they lost 2-1 at home to AFC Uckfield. A double strike from Uckfield leading scorer Callum Smith did for the Lions as the visitors marched on to a semi-final place against Peacehaven. On a filthy night at Nyetimber Lane, the away side started the brighter, with James Binfield kept busy in Pagham’s goal. Calum Smith will rue his missed chances, the offside flag more than once robbing him of an opening. When he did score on 28 minutes, it was struck well from the left. George Bingham was looking useful in Pagham’s midfield on his return to Lions’ colours, but at the back the Wollers-Davidson partnership was the one steadying thing for the home side. With the game moving towards half-time, Scott Murfin’s header went whistling over Uckfield’s bar – the Lions best chance of a tricky half. That was Murfin’s last involvement as Simmonds returned from injury to take his place at the break. A few minutes in an Uckfield free-kick bought a tremendous double save from Binfield to keep the score down. Nine minutes into the half, and the Lions were awarded a free-kick in a dangerous position. Up stepped Simmonds, and the ball rocketed from boot to the back of the net to liven up a sparse home crowd. The lead lasted until just after the hour as Smith got his second, capitalising on a rare defensive error from Pagham. Simmonds tested Uckfield keeper Louis Rogers from long range just before dangerman Bailo Camara came on for the visitors. He’d been on the pitch not four minutes before striking a ball across Pagham’s area that deserved better than drifting harmlessly out of play. 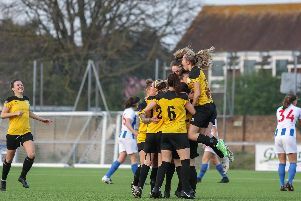 Hero turned villain as Camara’s foul on Goerge Bingham gained the Lions a rare free-kick. The ball was worked away by Uckfield, feeding Callum Smith, only for Binfield to yet again be in the way with a superb save. An unfortunate booking for Pagham came Ryan Davidson’s way for a foul on Camara. There was just time for Smith to shoot over when clear for Uckfield before the whistle blew on the Lions’ hope of silverware this season. Pagham: Binfield, Williamson, Hendricks, R Davidson, Wollers, Horncastle (Beadle 77), Bingham, Chick, Neighbour, S Murfin (Simmonds 45), Prisk; Davidson, Hubbard.